Even with tree trimming we often resort to power tools. Sure, there’s a difference between minimal pruning and lopping, and big tree trimming jobs; but for the big stuff, we often rely on the good ol’ chainsaw. 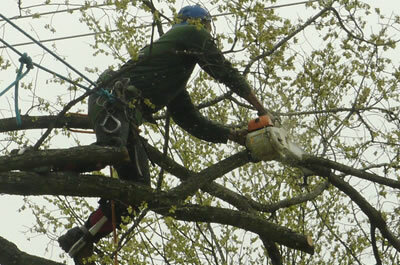 Chainsaws allow an individual worker to cut big branches that are high up in a tree, in a matter of seconds. We’ll put a man up in the tree (securely of course), ensure that there’s a safe landing zone or tie off the limb to be cut, and fire up the chainsaw. Chainsaws make tree trimming quick, and when performed with professional experience, quite safe! Tree stump removal isn’t as easy as tying the stump to the truck. It’s an unfortunate truth, but most tree stumps from fuller growth trees are near impossible to pull out with a truck or even a tractor. Tree stumps are stubborn and usually rather deep-rooted. Fortunately, there’s a better solution. A stump remover is a powerful machine that slowly hacks away at a stump. The stump remover features a massive rotating saw that pivots left and right as it lowers towards the earth. The stump is essentially turned into a fine mulch – sawdust really – and the entirety of the above-grade stump can be devoured by the stump remover. We can even go slightly below grade to ensure that you have level ground so that you’ll be able to plant sod or place a building on the plot that recently housed a tree. Tree health care isn’t as simple as water and sunshine. Although some trees may thrive near river banks and lakes, many trees simply can’t thrive on drier land without additional nutrients and aeration. That’s why we provide tree health services here at JRP services. We’ll pull out all the stops and directly inject super-rich nutrients into the ground surrounding your tree. When we inject nutrients into the ground with our pressurized injector, we’re capable of sending nutrients right to the source of a tree’s health – the roots. We’ll inject nutrients around the diameter base of your tree, providing root fertilization as well as a bit of healthy aeration! For small tree planting, we stick to shovel and boot, but for bigger projects, we may bust out the skid-steer. Skid-steers are ideal for quick digs because they’re fast, easy to operate in small spaces, and versatile. If you have a tree to plant with a ball root structure that’s a few feet wide, we may resort to the skid-steer hoe to get the heavy digging done. Deep digging is crucial for a new tree. It allows for proper depth of planting, ensuring that the roots will have plenty of access to nutrient-rich dirt, as well as making sure that tree roots won’t poke out into your yard or landscape in the future. Please, feel free to get in touch with JRP Services to get started on making your treed landscape pristine. Use us to get rid of dying, dangerous trees, to obliterate tree stumps, to reinvigorate your trees, or to plant a tree in your landscape!